Unlike Facebook, which has built in apps and metrics and functionality, Twitter is open-source. Anyone can build tools and uses for Twitter that get widely adopted by others (like Hootsuite, my favorite way to use Twitter), and it’s not always easy to figure out what all of those tools and uses are, because they’re not baked right into the platform. Even some of what we think of as native Twitter functions, like hashtags, were homegrown by users. When you start out on Twitter you only need to learn Twitter, but in fairly short order you then get a handle on some of these outside functions or tools. Whether it’s a tweet scheduling app, a measurement app, or a trackable link shortener, you won’t get far (as a business tweeter) without the help of some third-party tools. Twitter itself has repeatedly said that it’s not a network, it’s a media platform. Unlike Facebook and LinkedIn, you can follow someone without them following you back. The public nature of everyone’s feed makes it very well suited for non-networked media campaigns and engagements. 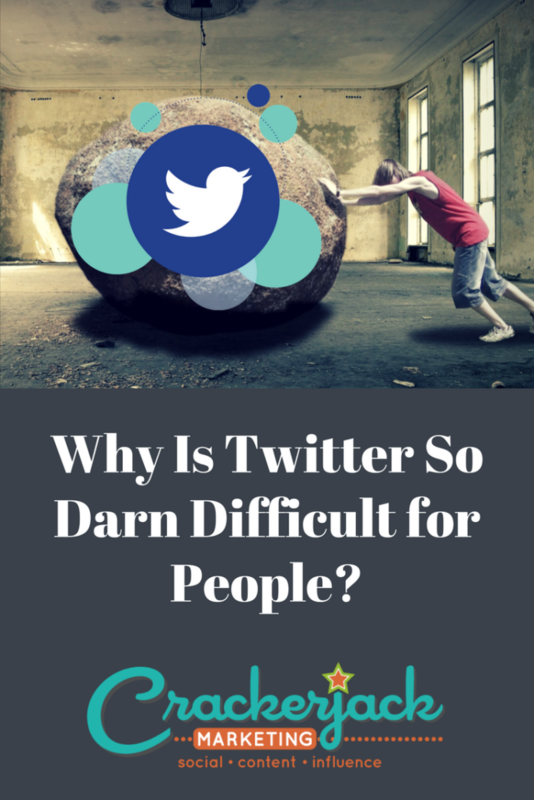 Certainly, you can use Twitter to network, and it’s a very powerful platform for that, but there are a myriad of other uses for Twitter beyond the networking aspect. Use Twitter to provide customer service, create a mini-newsmagazine for your business, hold interviews, throw online events, or write a novel. One of my favorite twitterers is @arjunbasu – an author who writes 140-character short stories on Twitter. He’s not engaging socially, he’s creating art with his tweets. Anyone can follow him and be amused by him. No question, that’s media. 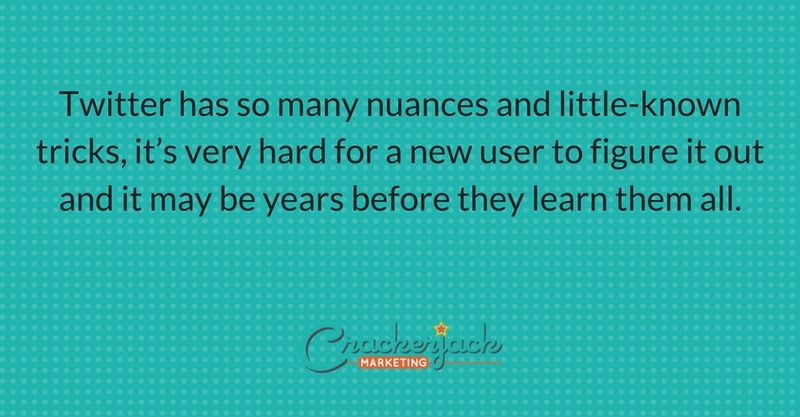 Twitter has so many nuances and little-known tricks, it’s very hard for a new user to figure it out and it may be years before they learn them all. In part, Twitter was built that way – the 140 character limit necessitates short-form commands and functionality shorthand. It’s kind of like an MS-DOS command prompt, from back in the day. If you use an @username as the very first piece of content in a tweet (if the @ is the first character), that tweet is only seen by that person and anyone who follows you both mutually. It is amazing to me how many people don’t know this, really through no fault of their own. This is definitely the #1 “insider” thing that I get to teach people. 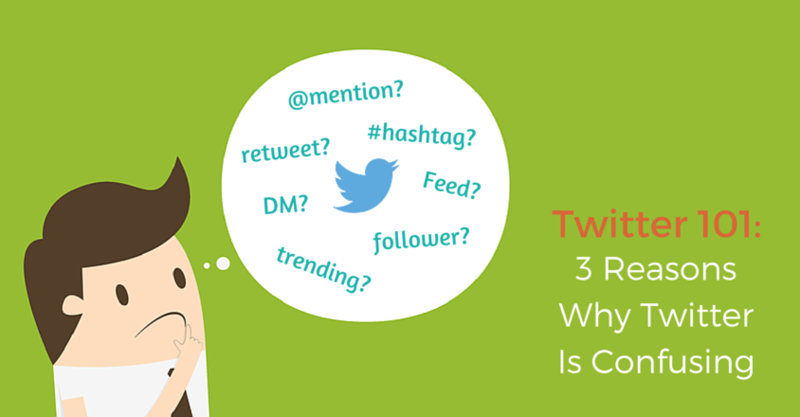 Use Twitter’s Favorites functionality to bookmark tweets you want to refer to or share later. If you Favorite someone’s tweet, they’ll also get a notification (if their notifications are set up to receive them), which will show them that you engaged with their tweet. My advice to people who are intimidated by or feel they can’t figure out Twitter: be patient. Jump in and start tweeting. It will take a while to build your following, so use that time to connect to people who know you well (and will completely forgive any faux pas you make) and experiment with the platform. And remember, everyone makes mistakes: there are very few things that are truly dreadful on Twitter. Now go forth and tweet! And definitely get in touch with me (here in the comments or via Twitter, natch) if I can answer any questions about Twitter for you. https://crackerjackmarketing.com/wp-content/uploads/2017/02/CJM-Header-Logo-New.png 0 0 Stephanie Schwab https://crackerjackmarketing.com/wp-content/uploads/2017/02/CJM-Header-Logo-New.png Stephanie Schwab2016-05-11 08:00:182018-02-12 22:32:17Why Is Twitter So Darn Difficult for People?